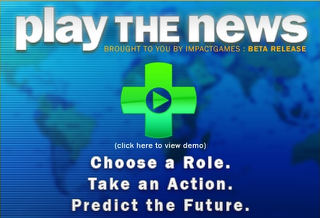 Play the News by ImpactGames has been one of the best attempts so far at creating a framework for a continued series of editorial Newsgames. The idea was to turn news stories into short games and let players cast votes on the proposed actions of involved parties, both on what they ought to do and what they would most likely do in reality. Each player would have a prediction accuracy rating that would be updated as the real-world situation evolved and came to a conclusion. Although the game is no longer actively supported, the old scenarios are still available online for interested.